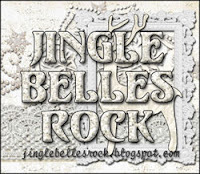 It's nearly time for another season of fun, friendship and inspiration at Jingle Belles and what better way to celebrate than with a brand new header for 2019! And while we're at it, how about a new blog badge as well? 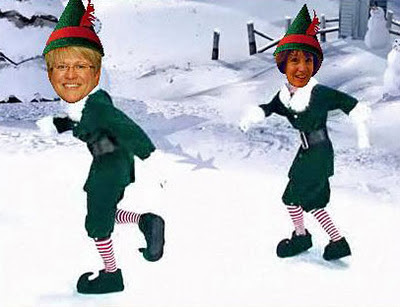 Thanks for sharing your holiday treats with the Jingle Belles ... it was so fun seeing all the different ideas. the addition of the doily and striped twine were both perfect finishing touches. we loved how his Santa hat is even a bit askew ... so much holiday spirit! mugs of holiday cheer ... Oh What Fun! And now I know we're all waiting do find out who wins that fun prize, right? The completely random selection is: ***Lorraine Mastalski of Paper Vernissage***! please email smilynstef@aol.com so Santa can get that on its way! 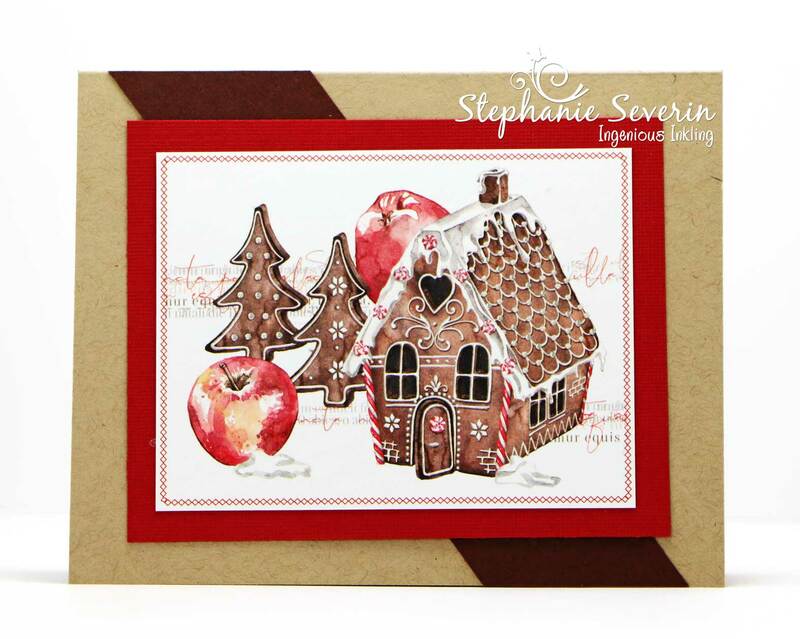 ♥ and for an extra, here's her adorable card. It's hard to believe this is our LAST official challenge of 2018, isn't it? We've had so much fun this year and we hope you have, as well. Many thanks to everyone who followed along, linked up, left comments and just generally made the first eleven months of our year fly by so quickly! We'll post one last link-up tomorrow, for those who aren't quite finished their cards yet... and of course we'll be back on January 1, 2019 to start this whole thing all over again! Happy happy holidays to everyone! We're still celebrating the food & drink of the Holidays this week at Jingle Belles (and remember, we've got a little prize for one lucky participant). 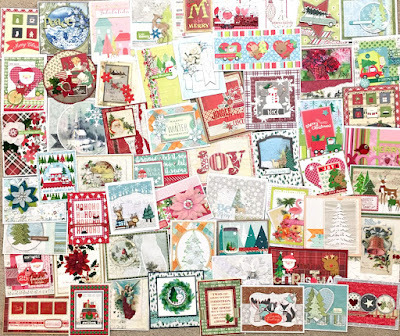 Lauren says, "Prima Marketing's "Santa Baby" collection recently arrived at my LSS, Paper Anthology, in Kenvil, NJ, and I'm completely obsessed already. 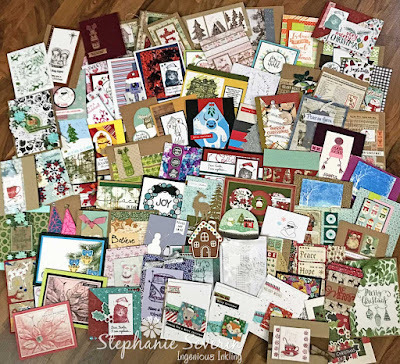 I suppose it's a good thing it wasn't released earlier in the year, or most of my holiday cards would bear an eerie similarity to each other lol. 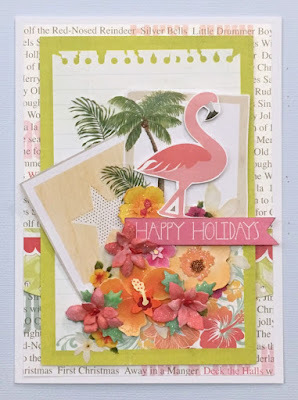 I've mixed also in some of Prima's "Havana" collection from this summer as well as some older, more neutral, papers to ground the design a little more. My layout was inspired by the current sketch saturday (#540)." 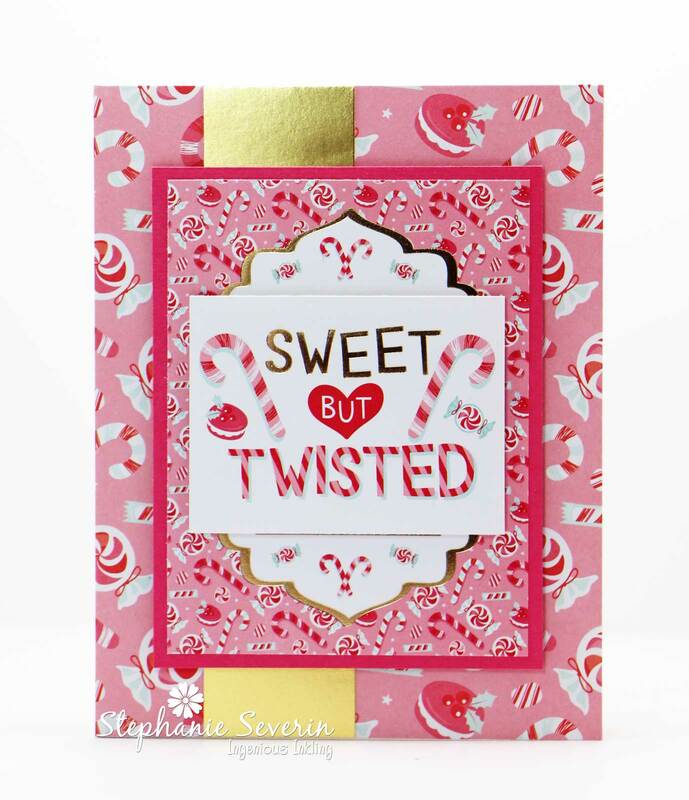 Stephanie says, "I couldn't resist going straight for the Christmas candy (pretty much like I do at any Christmas gathering) ... that's me, Sweet but a bit Twisted (where's the dark chocolate)." 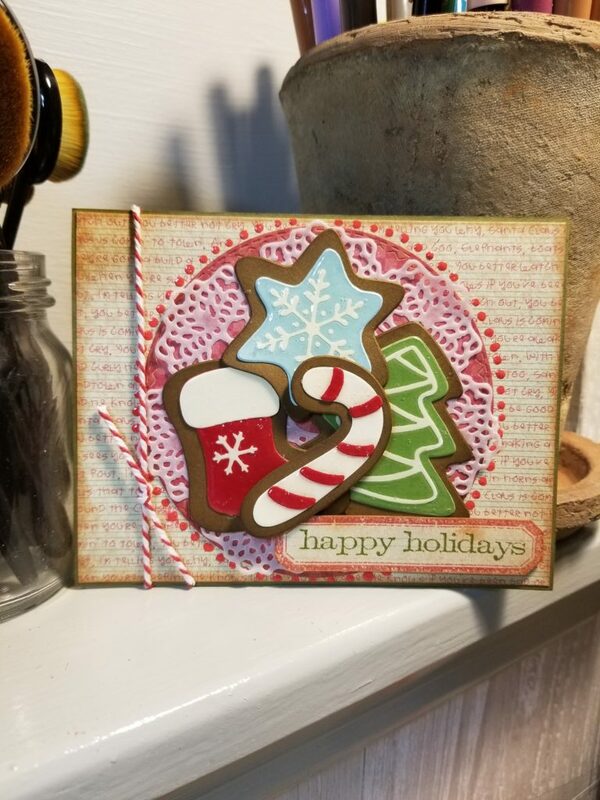 And the Jingle Belles are already looking forward to inspiring your with a year of holiday cardmaking in 2019 ... as we continue taking back December one Holiday Card at a time. 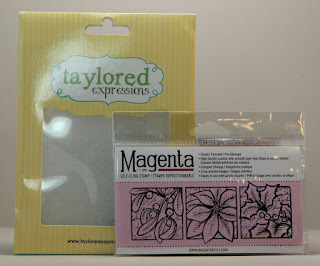 ...combined stencils and diecuts in a way that sings with CAS perfection! 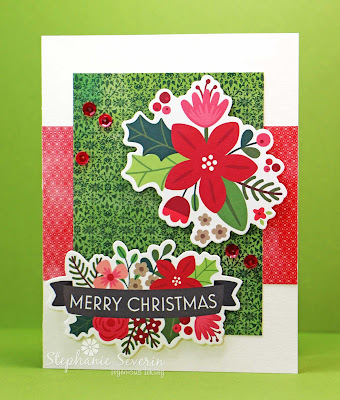 ...used a variety of bright, beautiful shades to instantly make this impressionist poinsettia stamp feel totally tropical! ...proves that amazing Christmas flowers can come in ANY color, including this luscious shade of denim blue! 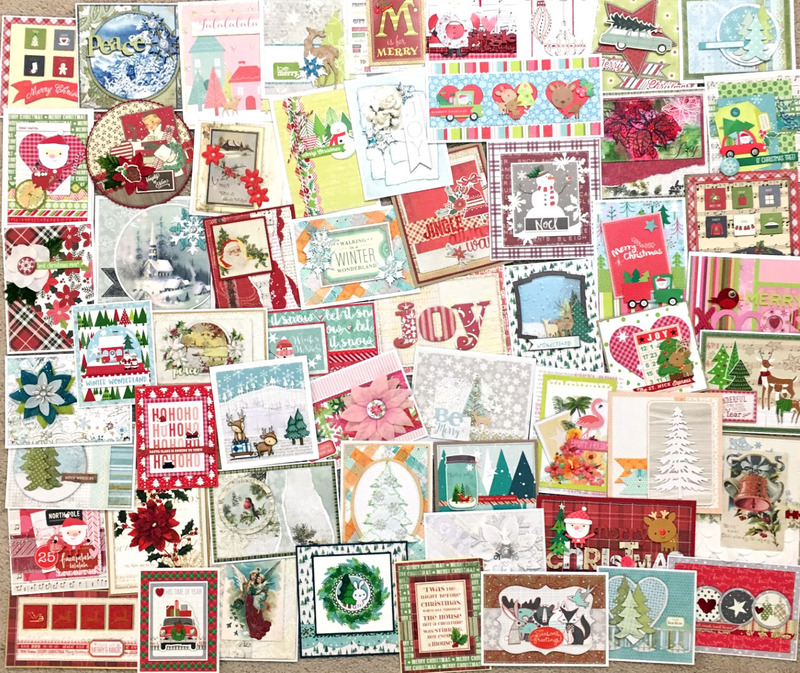 Many thanks to everyone who played along, we loved seeing every single card! We'll be back with a midnight snack for your creative appetite! 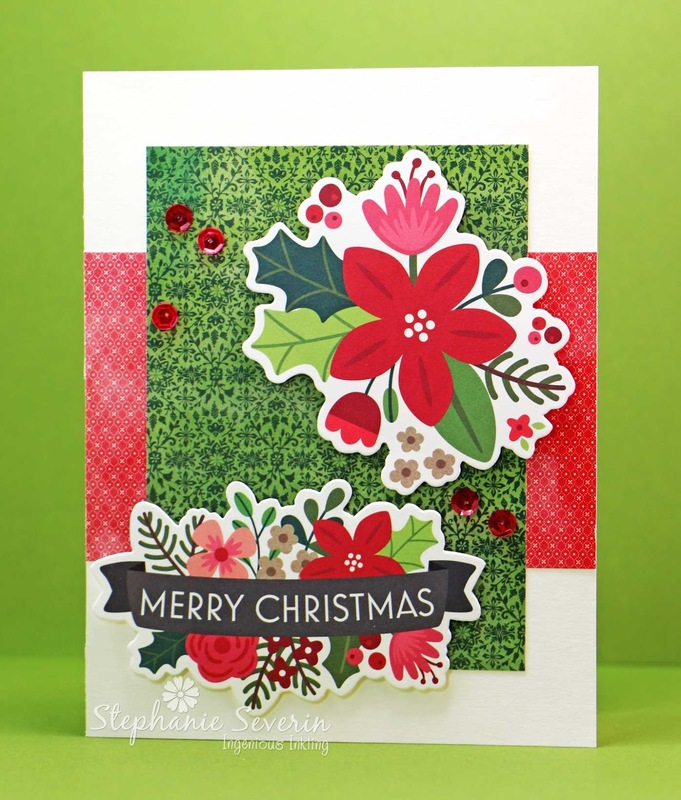 Stephanie says, "I loved the various floral designs in an unopened package of Pebbles Cardstock Shapes sitting on my *Christmas* shelf ... they were perfect to feature with some coordinating Basic Grey Papers in the Mojo Monday Sketch (yay! Julee has brought her sketches back)." Lauren says, "I couldn't resist going a bit tropical, of course, but actually Heartfelt Creations' system for making awesome dimensional flowers-- in this case poinsettias-- was my number one inspiration. 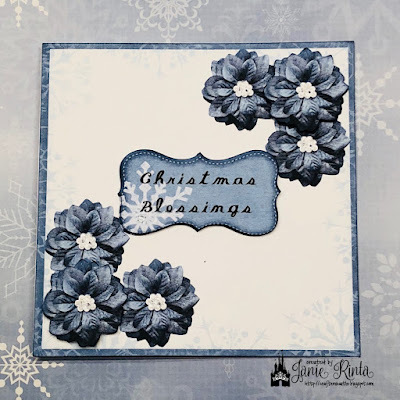 I used the coordinating stamps and dies on their very cool foam paper, added some color and ultra-fine glitter, then used my heat tool to make the petals curl into realistic looking blossoms. 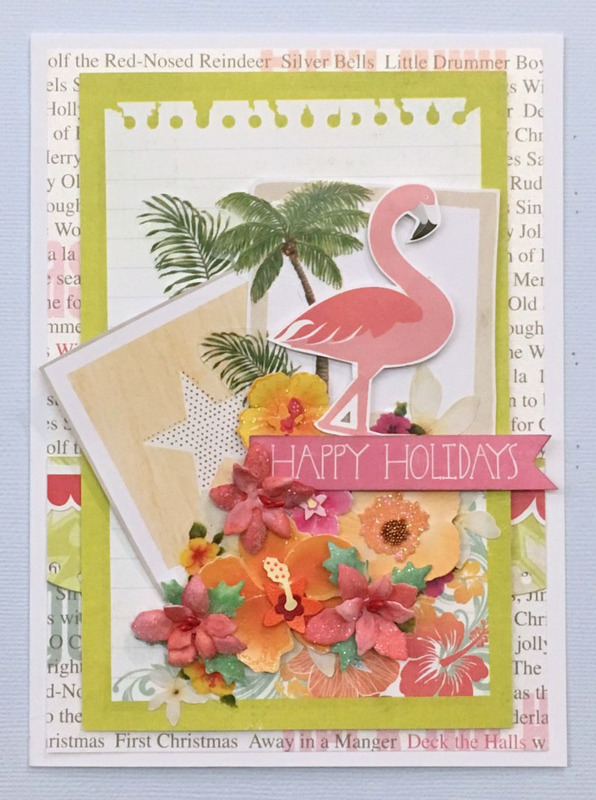 once I had loads of lovely poinsettias, of course i added some hibiscus, plumeria, palm fronds a flamingo and faux polaroids. Ok yeah... I might've gotten a teeeeeeny bit carried away!" And now it's your turn to get festive with flowers! Remember you don't need to incorporate anything tropical or Hawaiian! Any type of flowers, in any style of design, will do. Link up here before 6pm (EST) on Wednesday, November 14th. Keyword for galleries and Flickr is JB:18:23. We loved all of the creative Christmas Creatures that filled the gallery ... here are a few we thought were extra fun. she also provided a tutorial for an amazing reflection technique. because everyone has at least one grumpling at Christmas. to create an absolutely perfect winter scene. Come back and join us at midnight for a little *blooming* fun. We're still creating with CREATURES this week ... for most of us that means animals ... but it could mean a Winter Yeti ... or even an October Monster if you dare ... as long as it has a holiday theme, all creatures are fair game. 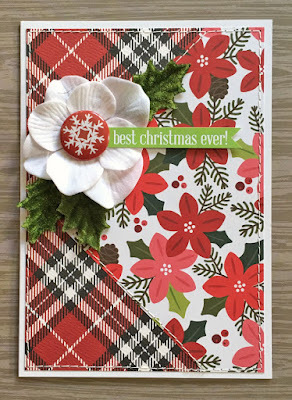 Lauren says, "I'm totally loving the Gina K Wreath Builder system. This week I discovered that if you use one of the larger round stamps to frame the center, you can punch the middle out and make a little window to reveal a sentiment or... in this case... a bunny! 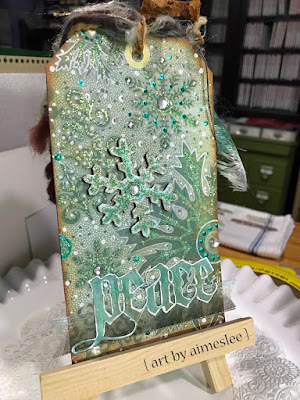 To create the wreath I used a bunch of different shades of green Distress Ink, most of the foliage branches in the Holiday Wreath Builder set, and some fab Eyelet Outlet Holly Brads. 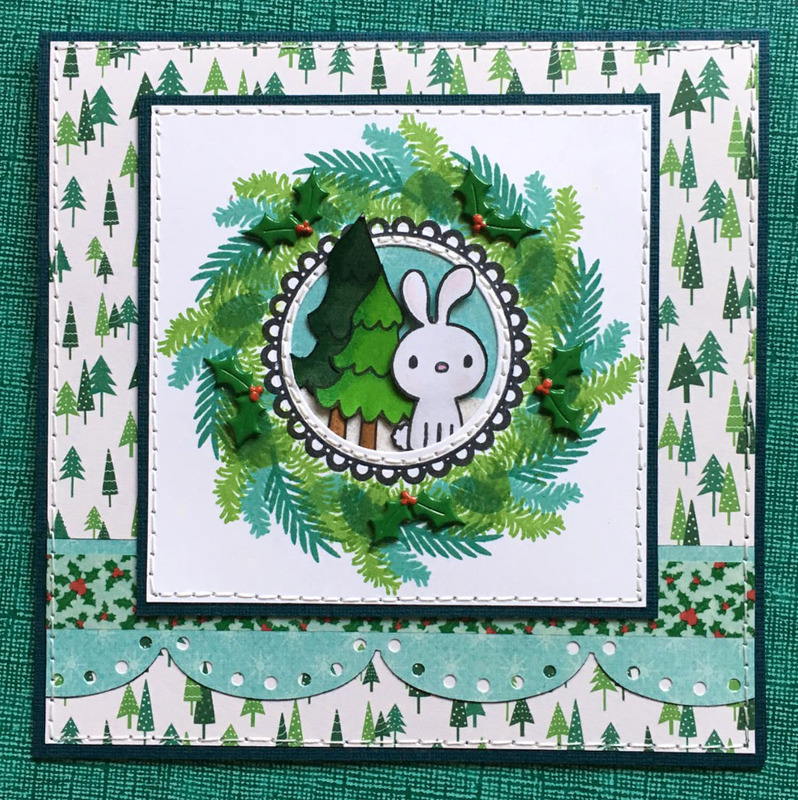 I chose the fun Pebbles' tree paper as a background before I started stamping, so that I could coordinate the greens to match!" 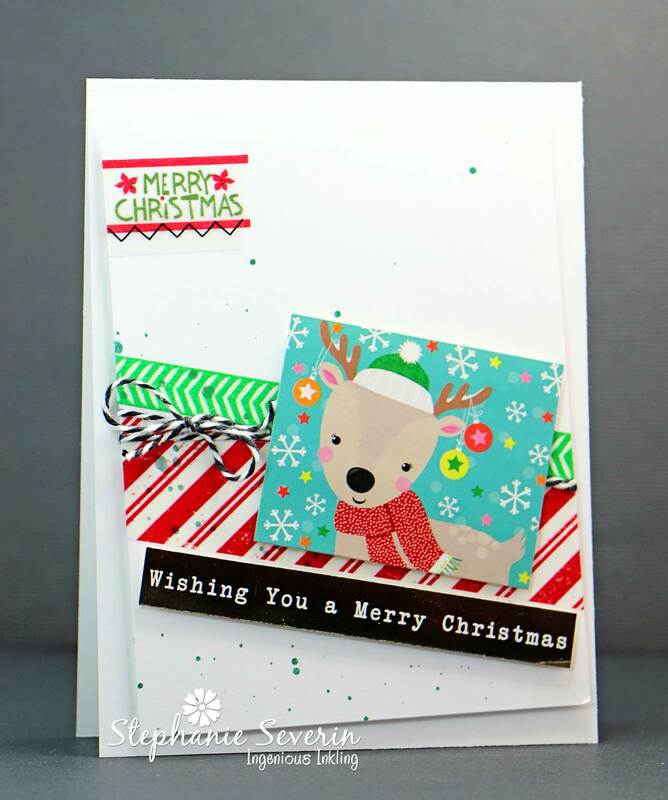 Stephanie says, "I went with another reindeer-themed design. 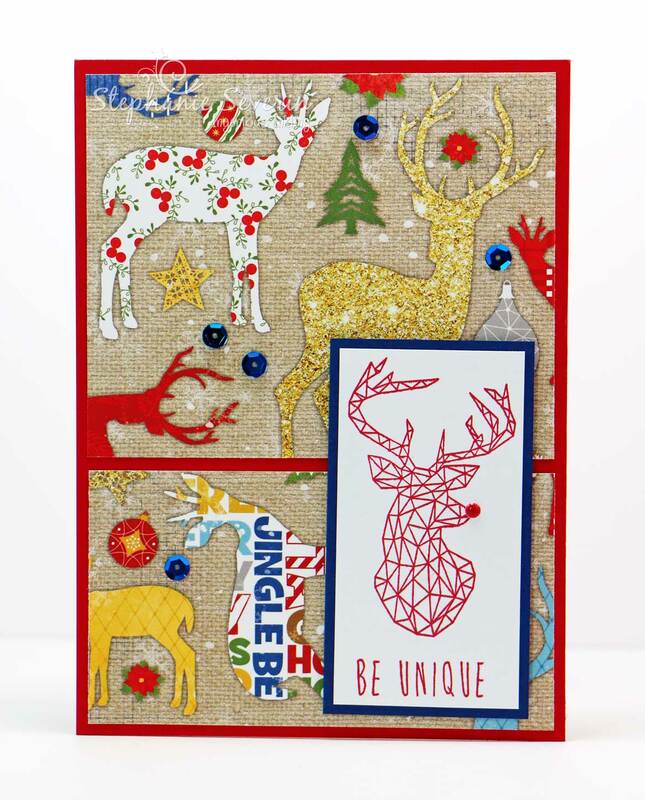 I've had this gorgeous sheet of Christmas Reindeer paper for a long time ... so I paired it with my fun new Triangle Deer & Sentiment from Lesia Zgharda Design. 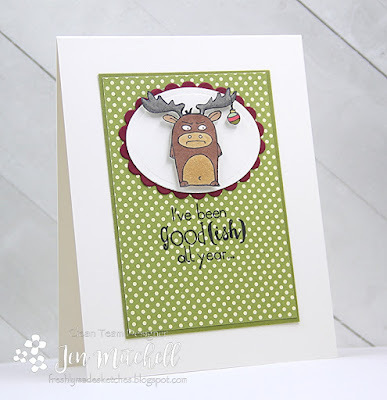 I added a red enamel dot to his nose to help him stand out in that herd of funky reindeer (of course I had to make sure I featured the texty deer that had part of Jingle Belles)." Remember you have until 6pm (EST) on Wednesday, October 31st to link up your creature-feature designs. The keyword for galleries and Flickr is JB:18:22. 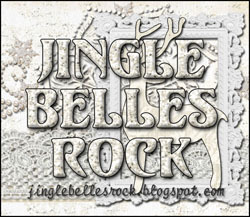 Description:For this week's Jingle Belles prompt we're asking you to show us your animals! (Flock ... get it?) It could be one of those sweet little sheep or perhaps a reindeer or camel … or maybe a Christmas Yeti is more your speed ... okay we're even allowing Christmas Monsters if you're in a Halloween mood and want to stretch the theme. 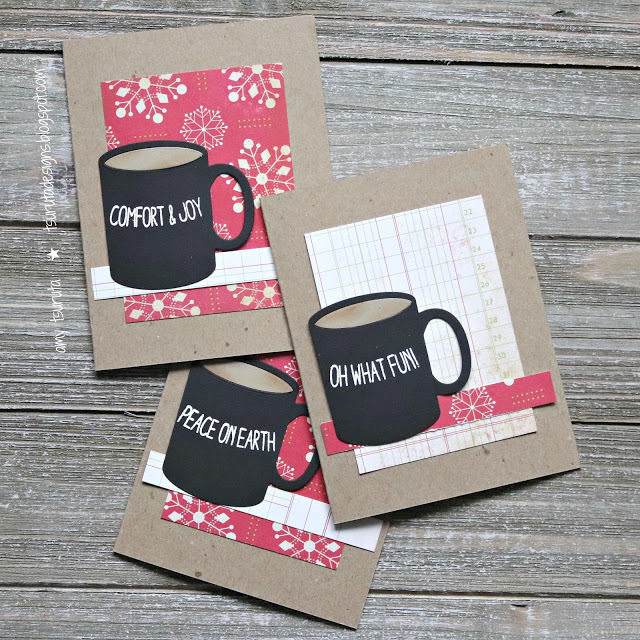 Stephanie says, "I found a trio of *vintage* animal stickers in my stash (vintage is a nice way of saying lost and forgotten about) and decided to channel my inner Tenia and make a trio of fun card designs featuring paint splattering, washi tape, twine, foam tape layers, and stitches. 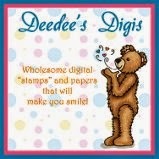 You can click-on-over to my blog to see the other two." 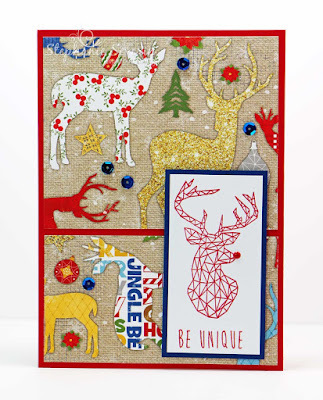 Lauren says, "I never can resist Doodlebug stickers, generally, and their reindeer in particular. I was a little shocked to discover that, despite having bought several reindeer-inclusive sticker sheets this year, the little dude above is the LAST? Definitely time to re-order! I've kitted him out with some very majestic Eyelet Outlet Antlers (he'll grow into them!) and given him a beautiful Gina K foiled background in which to strut his stuff. i arranged all the bits and bobs according to the current Atlantic Hearts sketch (#286) which i think you'll agree is pretty inspiring." Link your critter-centric creations here by 6pm (EST) on Wednesday, October 31st. Keyword for galleries and Flickr is JB:18:22. We *ALWAYS* love the kindness and skill that goes into all of your amazing PINK CHRISTMAS creations, and this year is definitely no exception. If you haven't yet treated yourself to a thorough scroll through the gallery, please do, there is soooooooooo much inspiration to be found, we really did have a very hard time featuring just a few cards, which we'll get to in a minute. ...was worried that this amazingly lovely creation might not have enough pink in it, but we beg to differ! Granted it's just a splash... but it stands out all the more against the gloriously textural white! ...created this serene but sparkly minimalist masterpiece on which we just cannot stop feasting our eyes! We (Stephanie and Lauren) are still making PINK CHRISTMAS cards and donating $2 each to the Breast Cancer Research Foundation for each card that's linked up with us this fortnight. 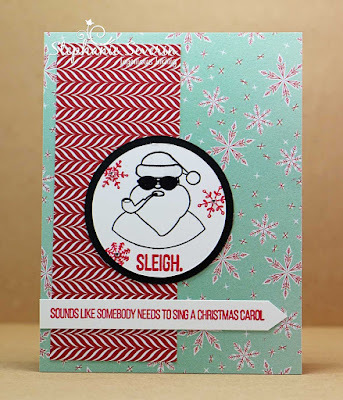 So we'd love for you to not only make some cards, but also spread the word! Thanks very much for your help! Lauren says, "I've used a few more bits and bobs from the Sugar Plum collection by My Mind's Eye, including the stripey pink paper and that beautiful badge. I've mixed in some other items-- and some darker pink-- in the form of patterned paper strips, some oversized pink fabric poinsettias, and a small (ancient!) sentiment sticker that was serendipitously exactly right!" 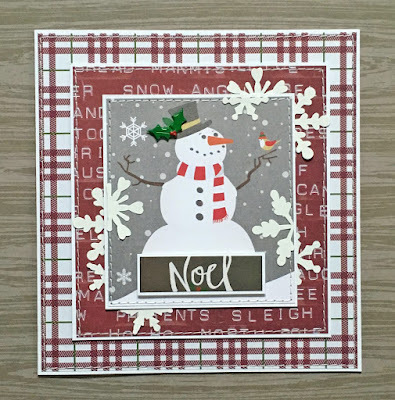 Stephanie says, "I had several border strips leftover from last week's card, so I decided to cover my entire kraft card front with border strips. 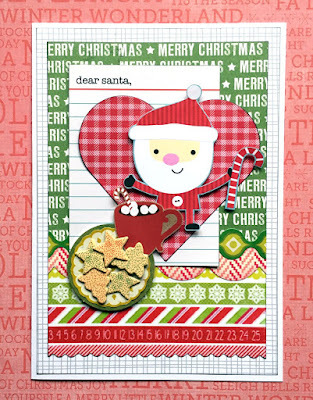 I trimmed the Santa and sentiment from another pieces of paper in the Prima Santa Baby Collection and finished with a few strands of pearls." If you've played along with us in other years, you may already know that at ♥JINGLE BELLES♥ we always devote the first theme of each October to making pink holiday cards as part of Breast Cancer Awareness Month, and that for each card that gets linked up, we (Stephanie and Lauren) each donate two dollars to the Breast Cancer Research Foundation. 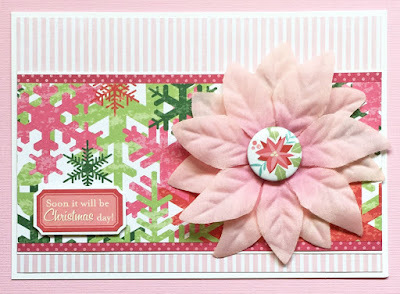 There are really no rules for this challenge other than the fact that each card has to be newly made, it has to have a winter holiday theme and it has to feature PINK prominently. 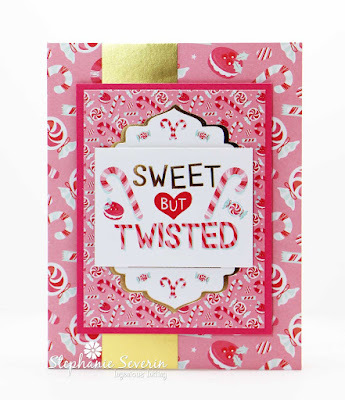 Does your whole card have to be pink? Certainly not. Can you combine other colors with the pink? Of course! Should you have more pink than say two or three baubles on your green tree set against a snowy white background? Well, yeah... that'd be good. 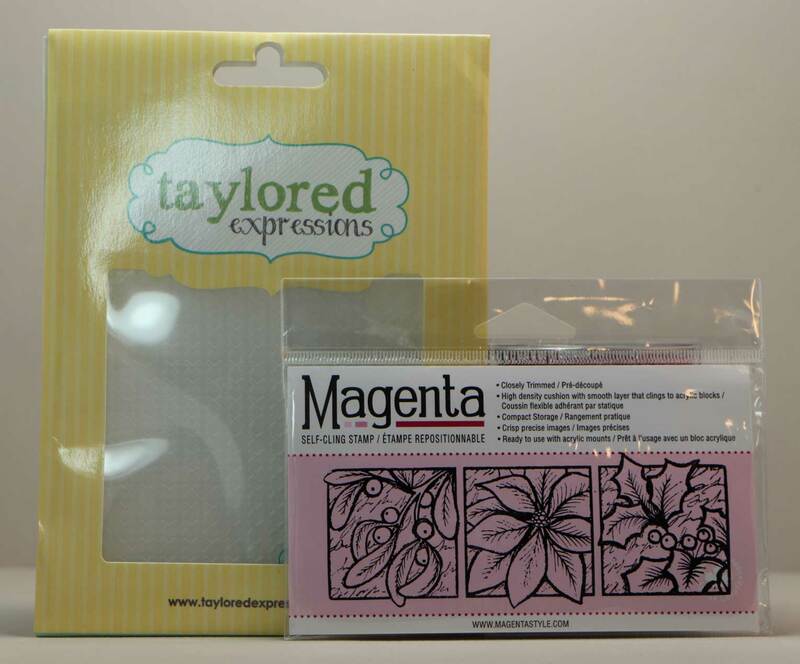 :) But other than that, we'll leave it to you to decide how much pink, what shade, and how to employ it! We're not generally all that big on self-promotion around here, but this cause is near and dear to our hearts and we'd love to get GREAT participation, so be sure to tell all your cardmaking friends, and feel free to share the graphic and our link on your blog or social media. 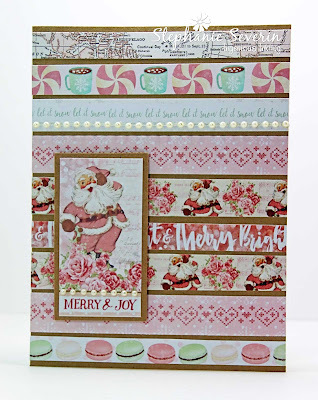 Stephanie says, "When I saw the new Santa Baby Collection by Prima at my local Scrapbook Store, I knew I had to have it for at least one of my Jingle Belles Pink cards. I combined two papers with a journaling notecard and fun puffy stickers." 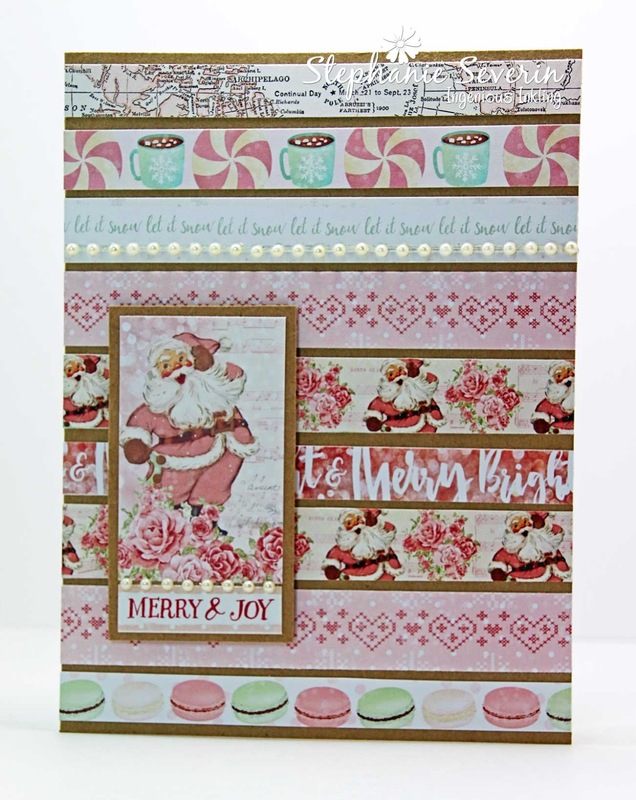 Lauren says, "I also used a collection that I chose specifically with Pink Xmas in mind, but in my case it was "Sugar Plum" of a couple of years ago from My Mind's Eye. 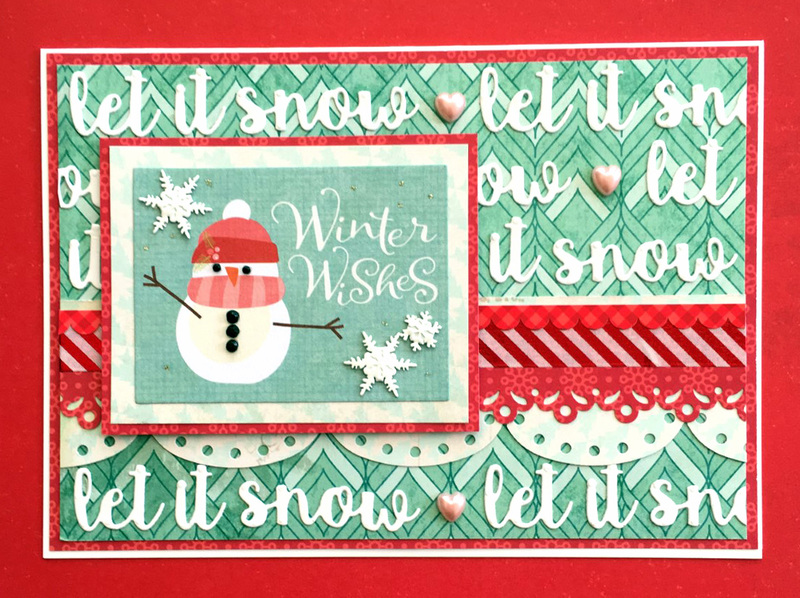 I combined patterned paper, a sentiment sticker and some cardstock diecuts together in a sort of landscape, completely with glitter paper snow, obviously!!!" We'd love to get as MANY cards as possible for this one, so we can raise as much money as possible. So please link early and link often!!! Deadline is 6pm (EST) on Wednesday, October 17th. Keyword for galleries and Flickr is JB:18:21. Put Your (PINK!) Thinking Caps On! 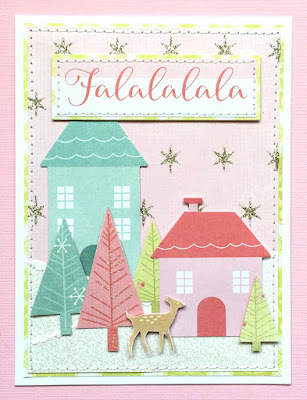 Because at ♥JINGLE BELLES♥ we always devote the first theme of each October to making pink holiday cards as part of Breast Cancer Awareness Month, and for each card that gets linked up, we (Stephanie and Lauren) each donate two dollars to the Breast Cancer Research Foundation. We'll go live with this challenge at 12am (EST) October 5th and wrap up at 6pm on Wednesday, October 17th. Are there lots of rules? Nope! Other than the fact that each card has to be newly made, have a winter holiday theme, and feature PINK prominently. Can you enter more than once? YES!!! In fact, we'd be thrilled if you'd take it as a personal challenge to cost us as much money as possible for this wonderful cause! We loved seeing all of the version of SNOW in the gallery ... so white a pretty for sure. 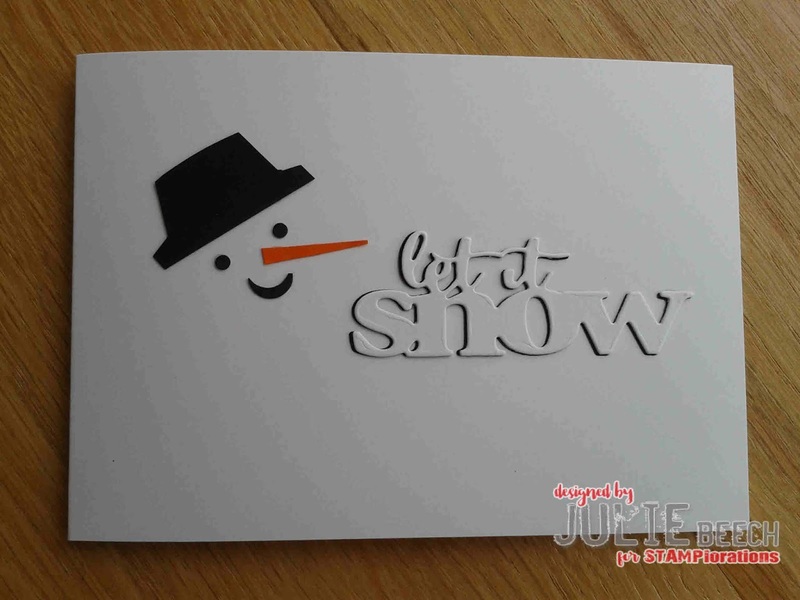 used the white space of her card to create an adorable snowy card. The slight black shadow on the die cut make it pop perfectly off the white background. CAS Perfection. 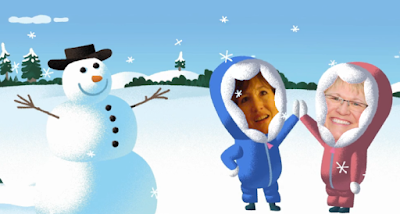 shared a *Snowman Selfie* that made us giggle outloud ... love that little guy trying to squeeze into the picture at the back ... and those colors just pop for a fun snowy scene. created this gorgeous, glittery, layered monochromatic SNOWY tag featuring some of our favorite vintage Basic Grey papers (Fruitcake) ... this girl knows how to rock the bling. Make sure you come back at midnight for one of our Annual PINK events you won't want to miss. We're still creating with SNOW this week and we love all of the variations in the gallery. 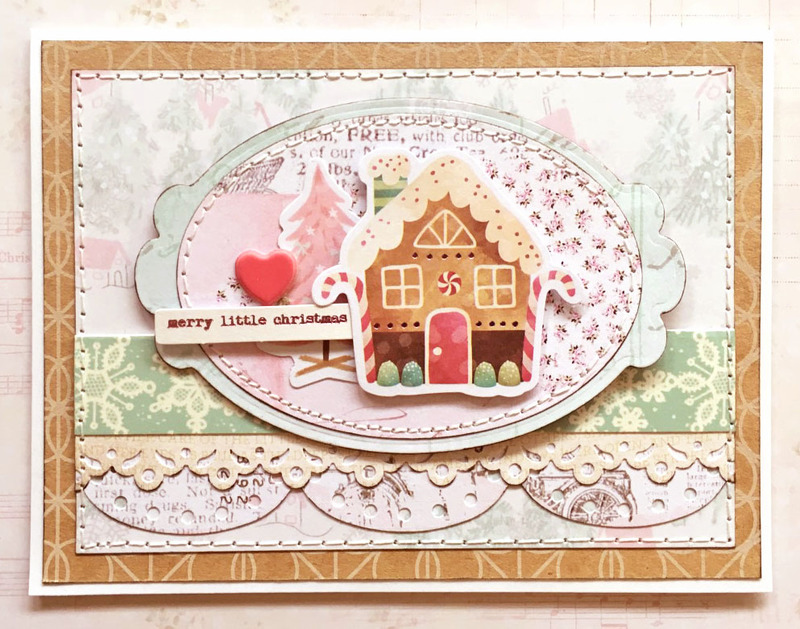 Lauren says, "I'm not sure I've ever made a holiday card in shades of burgundy, grey and a tiny bit of holly green, but I have to admit I quite like this one! I started with a Simple Stories snowman journal card, then found some ANCIENT papers that matched it really well. 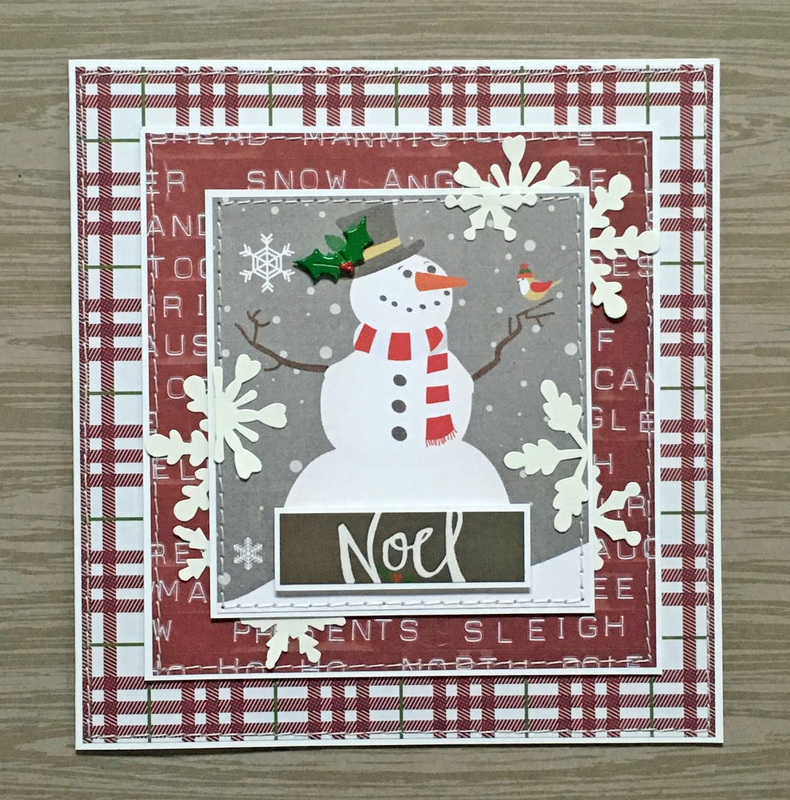 A sticker sentiment, some exceedingly elderly snowflake stickers, skinny white mats and an Eyelet Outlet holly brad complete the design!" 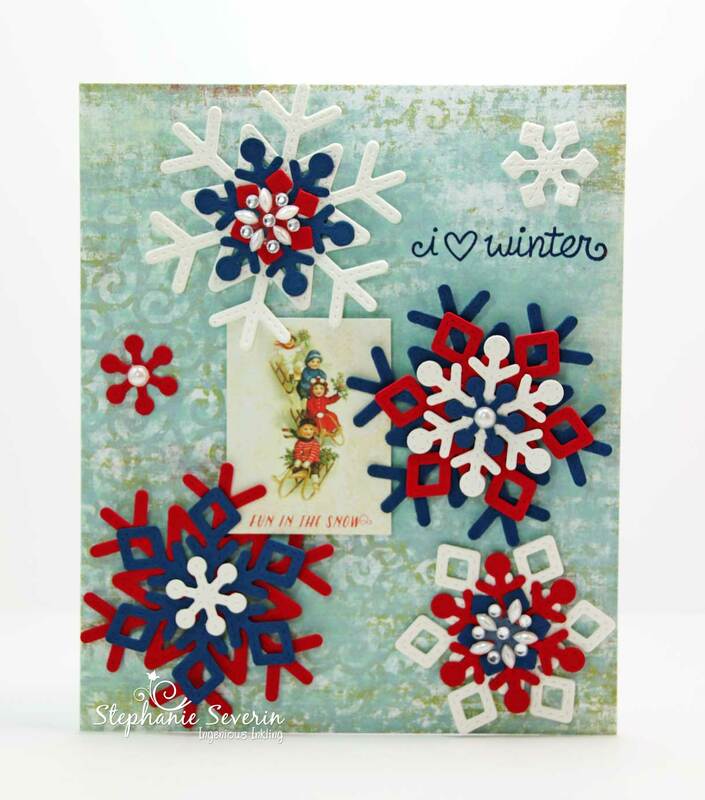 Stephanie says, "I built my card around Lawn Fawn's Stitched Snowflakes cut from Red & Blue Card Stock and Watercolor Paper. I had fun layering them and added jewels to the centers. 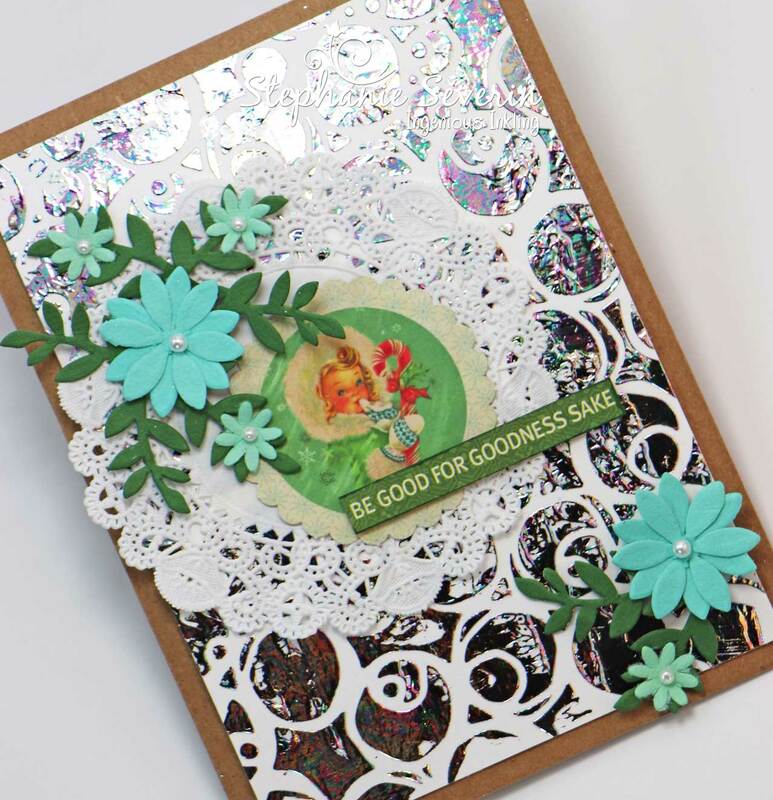 I finished with a Lawn Fawn sentiment from Yeti Set Go! 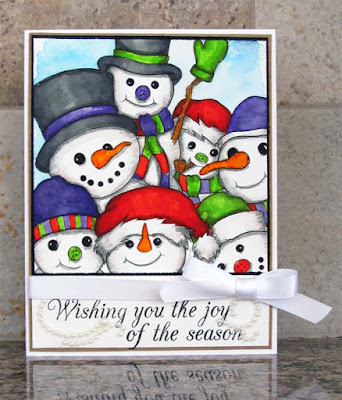 and a little card featuring children sledding in the snow." Make sure you link your SNOWY card up by Wednesday, October 3rd at 6pm (EST) at the post directly below this one. 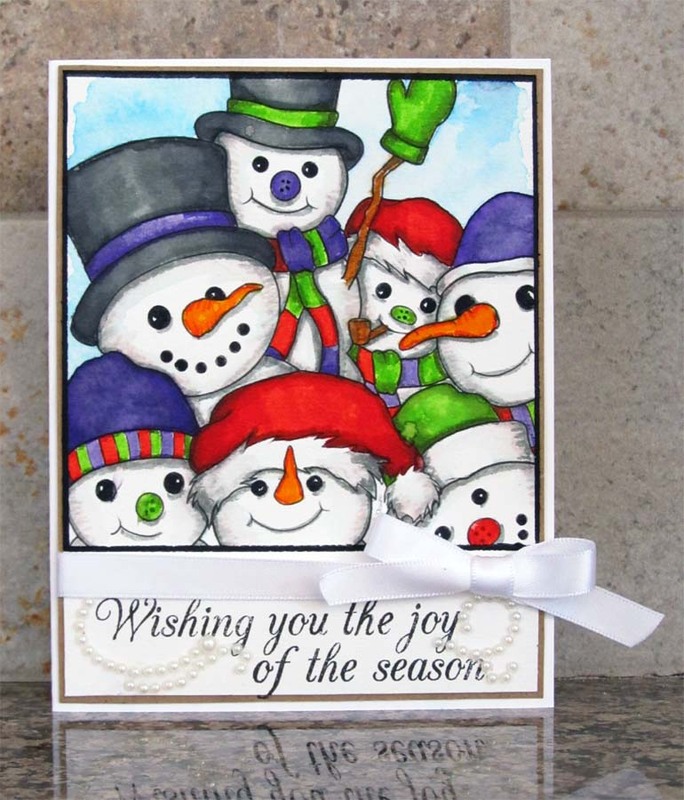 We're Letting it SNOW at Jingle Belles this fortnight ... creating cards featuring snow … it might be a snowy scene, snowflakes or maybe even a cute little snow-person. Stephanie says, "When I see the Jingle Belles theme for the week, I usually go shop my stash to see what I have that I might incorporate into my design. 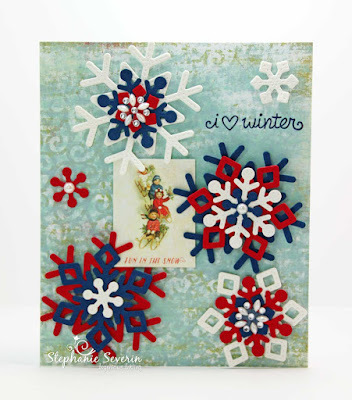 This week, I stopped when I saw this snowflake paper from Shimelle's Christmas Magic Collection (collection is still available digitally). 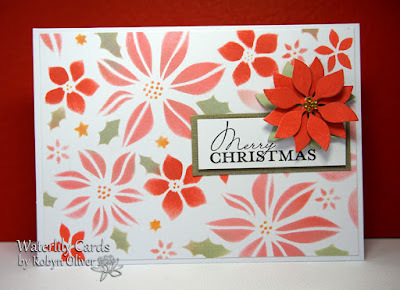 I paired it with the super-fun stamps from The Ink Road's Happy Holla Days. The layout is the sketch from Crazy 4 Challenges." 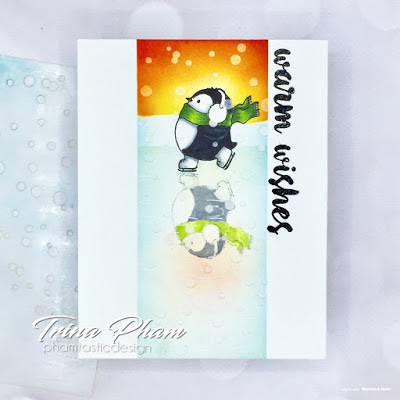 Lauren says, "My card features an adorable My Mind's Eye snowperson, set atop a background made with an awesome set of Winter Wishes word dies from Elizabeth Craft Designs. I cut "Let it Snow" multiple times from scraps of glossy white cardstock backed with "Stick It" adhesive sheets from Ken Oliver Crafts, so all i had to do was peel off the backing and arrange them. 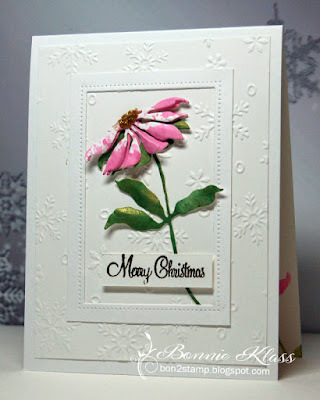 I embellished with Eyelet Outlet snowflake brads, heart pearls and washi tape and called it done." Link your snow-centric creations here by Wednesday, October 3rd at 6pm (EST). Keyword for galleries and Flickr is JB:18:20. 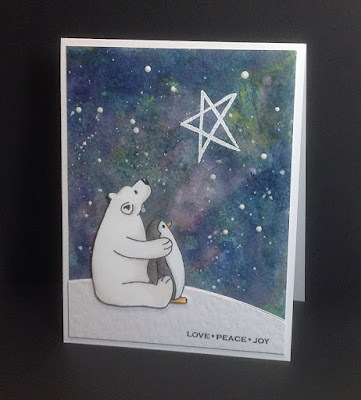 ...created an amazing watercolor galaxy background as the night sky, then found the perfect set of adorable stamped creatures to be appropriately awed by it! ...made us realize that from now on we definitely need to add, "or a DOVE!" 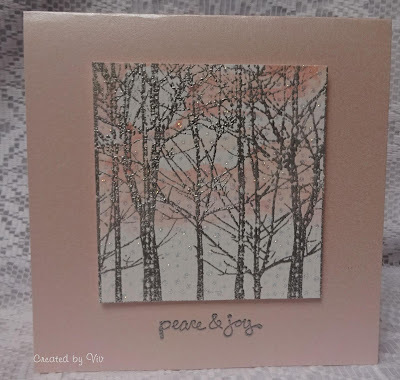 to our list of elements which perfectly sum up "PEACE" in greeting card form. 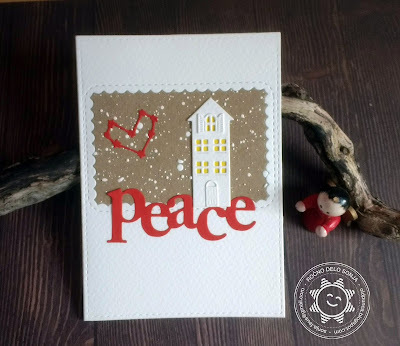 Combined diecuts, a CAS asethetic and a limited color palette for a card that offers the peace of perfect simplicity!